Ever since the 1800s, the Burmese were lured to the stable conditions and economic opportunities of Malaysia. However, upon arrival they found that they had to compete with Indians, Chinese, and other peoples from Southeast Asia. In medieval times, the port of Malacca controlled the straits through which trade with the East occurred. 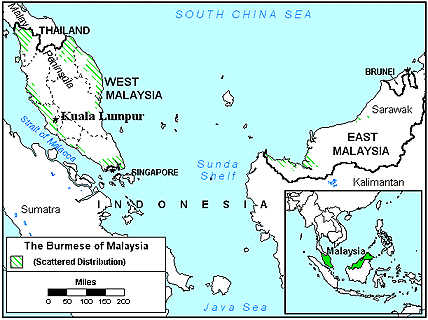 Located on the southwestern coast of Malaya facing Sumatra, the city possessed a considerable reputation for its trade. Merchants from many countries, including Burma, were attracted to it. When the British assumed control in the 1800s, Malaysia's commerce was limited to trade with Burma, Thailand, and Indonesia. Today, Malaysia sends palm oil and asphalt petroleum to Myanmar, and buys rubber, tin concentrates, and teak logs from Myanmar. This trade, however, is only of local significance for Malaysia, since their main exports go to Japan, Europe, and the United States. Some of the Burmese who are not still directly involved in commerce work on plantations or produce food for sale. Wet-rice and rubber are the main cash crops, while dry-rice and fruit are also cultivated. Other Burmese hold wage-paying jobs. Through the years, the best course for the Burmese in Malaysia was to identify themselves as Malay and obtain the favor of a local leader. Muslim Burmese could own land in reservations according to the legal definition of a Malay, which states that "a Malay is a person belonging to any Malayan race who habitually speaks the Malay language or any Malayan language and professes the Muslim religion". With this clause (still in effect today), some resident Burmese became "Malaysian". The Burmese have neither clans nor lines of descent. Marriages are monogamous (having one spouse), and parental preference is rarely enforced. For the first few years after marriage, the couple lives with the bride's parents, with the goal of setting up their own home within two or three years. The official religion of Malaysia is Islam. Despite the claim of religious freedom, however, there is severe pressure for radical Islamic reforms and the formation of an Islamic state. There are also discriminatory laws and actions against non-Muslims. A relatively small number of Burmese have given in to such pressures and have converted to Islam. The majority, however, have remained Buddhist. Although there are many Christian resources in the Bama (Burmese) language, it is illegal to witness to Muslims in Malaysia. Every effort is made to prevent the conversion of the small ethnic communities to Christianity. There is much discrimination and bureaucratic obstruction. Worship services in private homes are strongly discouraged, and churches are closed on flimsy reasons. Governmental restrictions make it extremely difficult for missionaries to work in traditional ways. Urgent prayer is needed for the spiritual climate of Malaysia to be reached with the light of the Gospel. 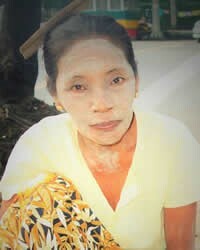 * Ask the Lord to send Christians who will witness with their lives to the Burmese of Malaysia. * Ask the Holy Spirit to give creative ideas for evangelism to missions agencies focusing on the Burmese. * Pray for the Lord to use the Jesus film to soften the hearts of the Burmese towards the Gospel message. * Ask God to open the spiritual ears of the Burmese as they listen to Christian radio broadcasts. * Pray that God will give the Burmese believers courage to share Christ with their own people. * Ask the Lord to bring forth a strong Burmese church for the glory of His name!View Burmese in all countries.